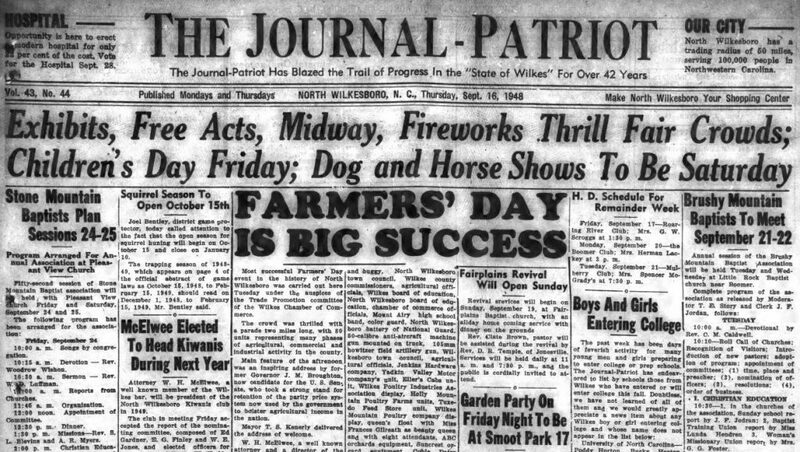 A September 1948 article about the success of the Farmer’s Day celebration. Three more years and nearly 4000 pages of the Wilkes Journal-Patriot have been newly added to DigitalNC, courtesy of our partner, the Wilkes County Public Library. While the collection previously held editions of the Journal-Patriot from 1933 to 1947, these new editions brings our holdings to the year 1950. Based out of North Wilkesboro in the northwest part of the state, the Journal-Patriot services Wilkes County. Published three times a week, the Journal-Patriot covers local headlines, often local municipal developments or political events. The annual Farmer’s Day celebrations were always very popular, with the newspaper regularly advertising them to attract residents. In 1948, the celebration had a parade that was two miles long, and featured an address by former Governor (and later Senator) J.M. Broughton. These Farmers Day celebrations were famous throughout Wilkes County, with the 1949 celebration having a record crowd at that time, and a record of nearly 125 floats, units, or groups on the roster. Having this new influx of pages from the Journal-Patriot helps us increase our representation of newspapers from the mountainous parts of the state. To browse through other materials from the Wilkes County Public Library, take a look at their partner page, or visit their website.